NAMI BI is a non-profit that aims to improve mental health services on the island, brings awareness and information to the community via ongoing events and conversations, and provides family support*. If you need help but not in emergency, see the Services page, or phone 207-229-6349, on-island. Also remember The Suicide Prevention Lifeline, anonymous, is 1-800-273-8255. Also you can look up Suicide Prevention QPR. NAMI BI Spring Conference, 2019. Children and Teens, Won’t They Just Grow Out Of It? As in previous years, the conference is open to all, residents and visitors, to drop in for sessions as they wish. Details of the Program are here. Friday 17th May evening, will be introductions. We end on Saturday 18th with a community Round Table where we can exchange views, summarize where we are now, and think about what next. *NAMI-BI offers a free confidential and safe Family Support Group for individuals (over 18) with a family member or close personal friend of family living with mental illness. We meet in the Island Free Library, Room C from 10 – 11.30 am on the first Saturday of each month. Facilitators are locals who have received extensive training and also have family with mental health challenges. Inquire 860-202-1124 or 401-486-9278, for yourself, or if you are a friend of a Block Island family. 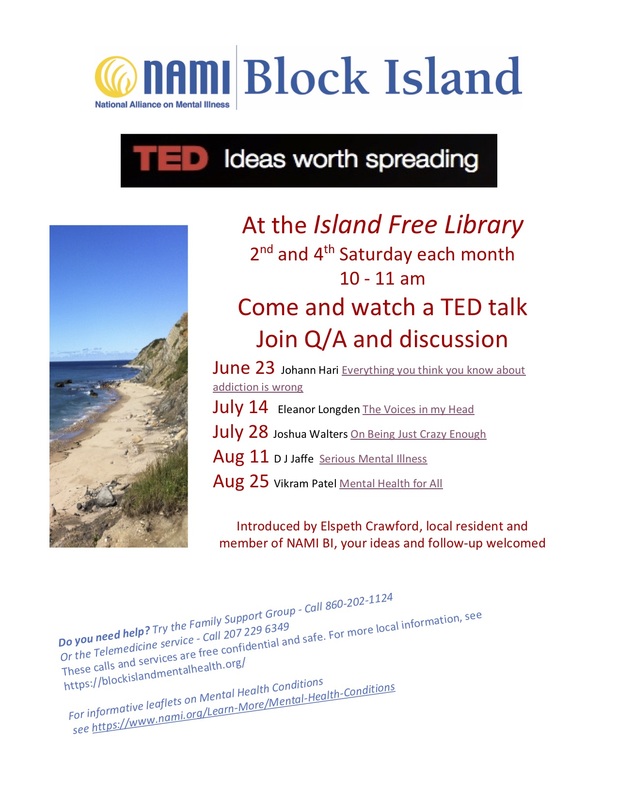 During the summer, 2018, NAMI BI and the Island Free Library showed a series of TED talk on the 2nd and 4th Saturday each month, 10 – 11 am, at the Library. All, residents and visitors, were invited to come, watch, then join in Q/A and discussion. Whether or not we agreed with the TED speakers, there was lively discussion as well as information, much of it from those who attended as well as from the talks. Details of dates and topics here. Suicide Prevention: NAMI BI hosted an event from the QPR Institute. It was a SHORT event, which really brought the CAN DO into the room. QPR is analogous to CPR and stands for Question, Persuade, Refer. The help given was demystifying and practical, but didn’t fudge that Learn to Listen is hard work, and takes emotional effort. 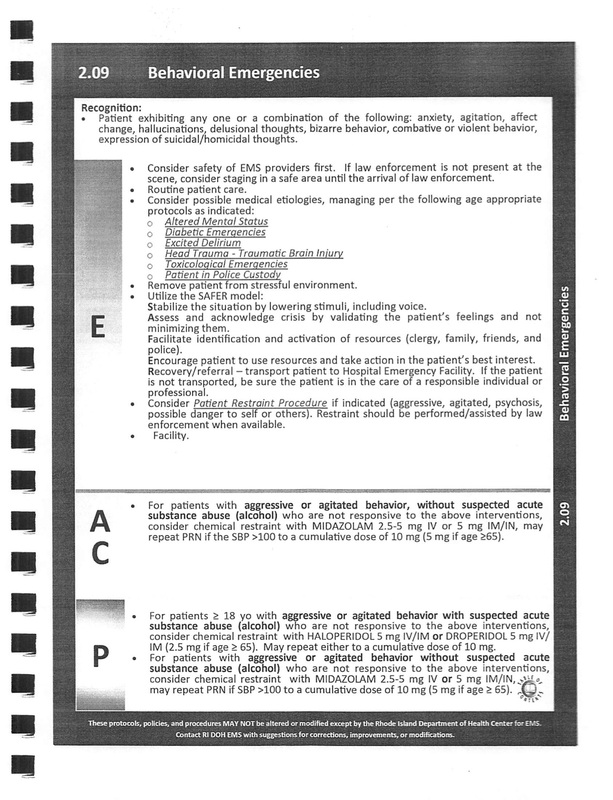 Just like CPR: ANYONE can learn this stuff, and you may never need it, but, you might! On Friday 18 / Saturday 19 May 2018, during Mental Health Month, Block Island Spring Conference was held, on the topic Depression: A Community Conversation – what do we know? what can we do? Others Recent Events Report: Brought by NAMI RI, in February, two programs took place in BI school: “Inside Mental Illness” for High School Students and “Parents and Teachers as Allies” to which all in the community were invited. Click here to access the slides that accompanied these interactive events. The Mental Health Task Force began some years ago in the wake of the tragic death of a resident with mental illness who could not receive services on island. There are several ways in which the community can be involved. Look at “Can You Help“. Join in the Community Conversations. Come to the BI NAMI events that are advertised in The Block Island Times and on the Block Island Bulletin Board. Make contact or comment in the community posts. You might like to write a post – please ask. You might have found an article of interest – please send. See how we have succeeded so far, here. Or, learn how you can help us succeed even more. Or, find help for yourself or a family member or friend.